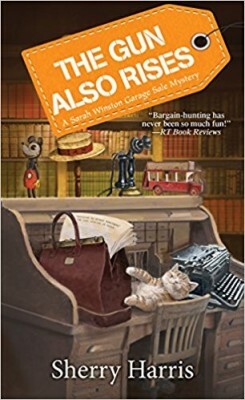 This week we review the latest Garage Sale Mystery by Sherry Harris, and have an interesting interview with Sherry. Details at the end of this post on how to enter to win a copy of The Gun Also Rises. There is also a link to purchase it Amazon, and an indie bookstore where a portion of the sale goes to help support KRL. Belle, a rich widow, has summoned Sarah Winston, garage sale specialist, to visit her home. The invitation was hand-written on beautiful stationery and delivered by messenger. It’s enough to cause minor panic in the calmest person. Belle has decided to downsize. Since many items are genuine antiques, she has experts for those. She wants Sarah to sell her guilty pleasures—popular mystery books. It’s all Sarah can do to inventory them. The temptation is strong to just sit down and read every one. There are books everywhere, including the attic. It’s a time-consuming job but a rewarding one, too. Of course, there are always surprises when going through so much stuff, some for entertainment only, some valuable. When Sarah finds a truly priceless set of papers, the action ramps up into full speed. Belle is assaulted, her maid is killed, bullets are flying, and Sarah’s in the line of fire. With the help of her police friends, Awesome and Pellner, and neighbor, Ryne, and assorted friends, Sarah’s got protection, if they can get her to sit still and accept it. The thing is, she’s not just in need of protection from the killer but from a group of tweed-wearing literary treasure hunters. They’re more relentless than the killer! The police agree, there’s only one place Sarah can stay where the treasure hunters aren’t likely to find her and that’s at Seth’s house. He’s the DA and out of town on a case, her case actually, to prosecute the stalker she dealt with last year. He was also a love interest but now things are just awkward. With no other choices, she agrees. Luckily, her brother Luke arrives in town and is able to keep her company and mostly, out of trouble. This is the sixth book in this thoroughly enjoyable series. Sarah is someone you’d meet and be best friends with in five minutes. She got used to making friends quickly when she was a service wife, moving from one base to the next. There’s a nice subplot about a returning veteran who had to leave his dog behind in Afghanistan. 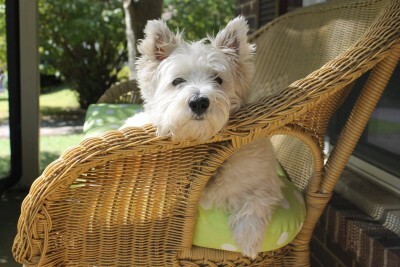 Sarah is arranging a fundraiser to bring the dog to him to help with his PTSD. Sarah’s also able to help the vet’s wife. Not everyone understands the sacrifices service families make. I particularly like Sarah as she’s starting over but not an instant success, isn’t perfect, and has the best friends. The garage sale premise is different and fun. At the back of the book, find an excerpt of I Know What You Bid Last Summer, also reviewed here. Readers can start with this book, but be warned, the first five will be in the To Be Read pile in no time. Sherry: I’ve been writing stories since I was in elementary school. Sherry: My first novel, Tagged for Death, came out in 2014. It is the first book in the Agatha Award nominated Sarah Winston Garage Sale mysteries. Recently divorced Sarah starts a garage sale business to make ends meet. Her ex, who is the chief of police in Ellington, Massachusetts, is accused of murder. While he’s hurt Sarah, she knows he’d never kill anyone and sets out to clear his name. Sherry: There’s only one exception in my mystery writing career. I’ve worked on a romance but haven’t had time to finish it. KRL: What brought you to choose the setting and characters in your latest book/series? Please tell us a little about the setting and main character of your book. Sherry: My husband was in the Air Force and we were stationed in Massachusetts near the small town of Bedford. I fell in love with the area. It’s so charming, rich with history, and oh, my, they have such unique ways of pronouncing things with their cute accents. Sarah Winston is my protagonist. like me, her husband served in the Air Force. It’s hard to have a career with all the moves so when Sarah divorces, she starts her own business setting up garage sales. KRL: Why yard/garage sales? Are you a fan of garage sales yourself? Sherry: My editor at Kensington came up with the idea for a series with garage sales. I fell in love with yard sales when I was in second grade and my best friend’s family had one. A lot of the things in my house are from yard sales. Sherry: It’s a combination of both. I love to share bits of life as a military spouse in the series. It’s not a “hit you over the head” thing but a peek at life on a base. And I add a bit of humor along with the more serious side of life. Sherry: I usually write in the afternoon because I’m not a morning person – unless there is a garage sale to go to! KRL: Finally another person who isn’t a morning person! Do you outline? If not, do you have some other interesting way that you keep track of what’s going on, or what needs to happen in your book when you are writing it? Sherry: I don’t outline. I have a loose plot in my head before I start. However, I’m working on doing more plotting and did more for the book I’m writing now – the first in a new series – than I’ve done on any other book. Sherry: Around two in the afternoon is perfect for me. Sherry: Oh, yes. I have two or three books sitting on my computer that will probably remain. Sherry: I have a folder full of rejections from the days when everything was still done by snail mail. I take them as badges of honor for finishing a novel and being brave (or foolish) enough to put it out there. Sherry: One bookstore stuck me in the children’s section because they were rearranging the adult section. My book covers are cheery looking. I spent the whole time I was there telling people not to buy my book for their children. Sherry: If I ever have time, I want to finish the romance and write a stand-alone thriller. Sherry: The whole crime fiction community is so generous and I’m so grateful to be a part of it. Sherry: Everything from internet searches, to police “ride-alongs,” attending citizens police academy, and asking lots of questions of people with expertise I don’t have. Sherry: Mysteries and thrillers are my favorites. Sherry: I love NCIS, Blue Bloods, and House Hunters International. Sherry: Don’t give up and get out there and meet other writers. Sherry: Thank you so much for having me and supporting authors the way you do! KRL: You are very welcome! What is something people would be surprised to know about you? Sherry: I used to do stock market reports on a local radio station in Cheyenne, Wyoming. To enter to win a copy of The Gun Also Rises, simply email KRL at krlcontests@gmail[dot]com by replacing the [dot] with a period, and with the subject line “gun,” or comment on this article. A winner will be chosen February 16, 2019. U.S. residents only. If entering via email please include your mailing address (so if you win we can get the book sent right out to you), and if via comment please include your email address. You can read our privacy statement here if you like. This is one of my favorite series! Thank you for the giveaway! I love this series! Sherry pulls you right in to a marvelous cast of characters and plenty of action. Congratulations to Sherry! I love your interview with Sherry! Love learning about the authors. I love this series! I love garage sales and my husband was in the Air Force also. So I knew I had to give it a read. I’m so glad I did. Really Really good! Thank you for the chance to win!? Nice interview! But in your synopsis of the plot of the book, the invitation was surely written on stationery (writing paper), not stationary (not moving). I haven’t started this series yet, even though I have the first three. Would love to win this one. Another great series. Looking forward to reading. Sounds like a good premise for a mystery. I like the part about the dog. Just ordered the first in the series.